TV Aerial and Satellite Installation Glasgow | Testimonials - See what our clients say. We are a trusted and experienced TV and Satellite installation and repair company in Glasgow. But don’t take our word for it, check out the testimonials from our customers or head over to our Facebook page to see more of our work. The engineer arrived on time did a great job for a great price, thank you! Aerial installed on the same day I phoned, thanks guys great job! Great service 5 stars, definitely recommend these guys to anyone. Top class company really well organised would use again. I got an aerial installed for £80 on my roof, I was quoted £200 else where before I phoned Fixed Price Aerials. Thank you. 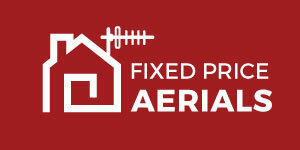 Called fixed price aerials had an aerial installed the same day would highly recommend thanks. Aerial & extra room for £110 thought was a great price thanks would use again. Couldn't believe the price compared to other aerial company's would highly recommend. I had an aerial installed on my roof the cable came down the back as I didn't want it seen going down the front guys did a lovely job would highly recommend A+ for me ! No mess no fuss great price great service thanks and would use again..